First we affirm that we desire to follow Scripture alone as rule of faith and religion, without mixing with it any other thing which might be devised by the opinion of men apart from the Word of God, and without wishing to accept for our spiritual government any other doctrine than what is conveyed to us by the same Word without addition or diminution, according to the command of our Lord. Following, then, the lines laid down in the Holy Scriptures, we acknowledge that there is one only God, whom we are both to worship and serve, and in whom we are to put all our confidence and hope: having this assurance, that in him alone is contained all wisdom, power, justice, goodness and pity. And since he is spirit, he is to be served in spirit and in truth. Therefore we think it an abomination to put our confidence or hope in any created thing, to worship anything else than him, whether angels or any other creatures, and to recognize any other Saviour of our souls than him alone, whether saints or men living upon earth; and likewise to offer the service, which ought to be rendered to him, in external ceremonies or carnal observances, as if he took pleasure in such things, or to make an image to represent his divinity or any other image for adoration. Because there is one only Lord and Master who has dominion over our consciences, and because his will is the only principle of all justice, we confess all our life ought to be ruled in accordance with the commandments of his holy law in which is contained all perfection of justice, and that we ought to have no other rule of good and just living, nor invent other good works to supplement it than those which are there contained, as follows: Exodus 20: “I am the Lord thy God, who brought thee,” and so on. We acknowledge man by nature to be blind, darkened in understanding, and full of corruption and perversity of heart, so that of himself he has no power to be able to comprehend the true knowledge of God as is proper, nor to apply himself to good works. But on the contrary, if he is left by God to what he is by nature, he is only able to live in ignorance and to be abandoned to all iniquity. Hence he has need to be illumined by God, so that he come to the right knowledge of his salvation, and thus to be redirected in his affections and reformed to the obedience of the righteousness of God. We confess then that it is Jesus Christ who is given to us by the Father, in order that in him we should recover all of which in ourselves we are deficient. Now all that Jesus Christ has done and suffered for our redemption, we veritably hold without any doubt, as it is contained in the Creed. Therefore we acknowledge the things which are consequently given to us by God in Jesus Christ: first, that being in our own nature enemies of God and subjects of his wrath and judgment, we are reconciled with him and received again in grace through the intercession of Jesus Christ, so that by his righteousness and guiltlessness we have remission of our sins, and by the shedding of his blood we are cleansed and purified from all our stains. Second, we acknowledge that by his Spirit we are regenerated into a new spiritual nature. That is to say that the evil desires of our flesh are mortified by grace, so that they rule us no longer. On the contrary, our will is rendered conformably to God’s will, to follow in his way and to seek what is pleasing to him. Therefore we are by him delivered from the servitude of sin, under whose power we were of ourselves held captive, and by this deliverance we are made capable and able to do good works and not otherwise. What got Calvin riled enough to indulge in biting satire? 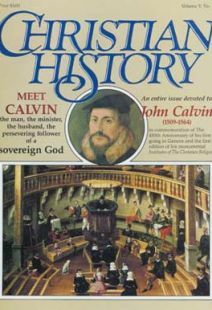 Some resources for further study of Calvin. Jan Amos Comenius: Did You Know? Fascinating facts about Comenius and his times.